Data has become a strategic asset and companies are increasingly investing in governance programs and tools to manage their data. A class of data that has received significant attention over the years is master data. Master data plays a foundational role because it’s shared between many systems and processes. Reporting and analytics rely heavily on master data to be able to combine data from multiple sources and create drill-down hierarchies. There is, however, still confusion around what data we label as master data. Looking at the diagram below, master data is the data in the overlap zone between all major systems. An important aspect of this definition is that master data is defined at the attribute level as opposed to the object level. For example, the ‘customer’ object in your ERP system is not master data, but the customer ‘name’ and ‘address’ is, provided these attributes are used across all major systems. 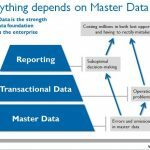 Master data is defined as attributes like customer name and address that are shared between all systems and processes. So, what do we call everything else? Application data. 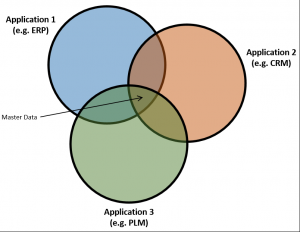 Application data is data that is specific to one or a few systems. In the diagram to the right, you can see “the other 90%” is used in only one or a few applications. This includes many attributes of the customer which are only needed in your CRM system and not in any other system. Why is this distinction so important? Because master data and application data have very different governance requirements. Master data requires rigid centralized governance because many different processes rely on it. You need to define global standards and deploy tools and processes that can keep this data replicated across the enterprise. On the contrary, Application data is best governed at a local level where people have the business context and subject matter expertise to manage their own data. Hence, there is typically a need for more flexibility and more business-friendly tools. Companies tend to get themselves into trouble when they try to solve application data problems with traditional master data solutions (i.e. MDM). 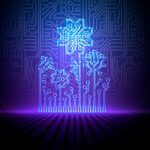 MDM tools and technologies are relatively heavy and complex and only suited for data requiring rigid centralized governance. Too many MDM hubs have become bloated to the point of inefficiency because they have been force fit to include segments of application data.